fans – meal-sized bowls of fresh, crisp salad. Salad!? At the ballgame?! Yup. Since 2012, Minneapolis’s Roots for the Home Team brings young urban agriculturalists together with hungry fans in the midst of Major League Baseball. “I wanted to change up the food mix at Target Field,” says Susan Dunn Moores (L) (’80 food science), the creative mind at the venture’s heart. Moores developed close associations with Urban Roots and Youth Farm, Twin Cities neighborhood garden programs with years of experience fostering youth leadership with sustainability and environmentally sound practices to raise and sell organic produce. Moores and 30 paid student interns from these garden partners form Roots’ core sales and marketing team. In the first three years, 70 percent of the produce for Roots for the Home Team salads was purchased from the garden partners. Moores relies on Co-op Partners Warehouse for additional supplies and to ensure the young growers’ produce meets commercial standards for harvesting, packing, and shipping for food service. Target Field’s Minnesota Sportservice prepares retail product for the games. Moores, a long-time entrepreneurial registered dietitian, gained corporate support for Roots’ efforts. The Twins Community Fund, Blue Cross Blue Shield Minnesota, Land O’ Lakes, JustBare Chicken, and others provide direct funding or in-kind services such as marketing support. Pre-season, Moores and the students collaborate, brainstorming and planning product and sales ideas before rolling the Garden Goodies cart into place at Target Field. In 2014 the Roots crew offered six salad varieties at 18 games – with two salads in rotation at each game – including the League’s All-Star Game. All told, more than 130 youth were involved in the program. One hot July Sunday afternoon, four students alternate in pairs, enticing customers with free samples and selling the finished product to hungry fans. One dad feeds his year-old son a bite of tomato. Son munches, dad grins. “At least I can say I had a salad at the ballpark,” he says. Moores stands by at the cash register. She had envisioned satisfied customers. But she didn’t expect the broad benefits for her young sales associates. Tsminuj (SHEE-new) Yang, 16 and a high school junior, gardened extensively with his family before his student-intern experience. “All I knew, I learned again in a different way,” he says. 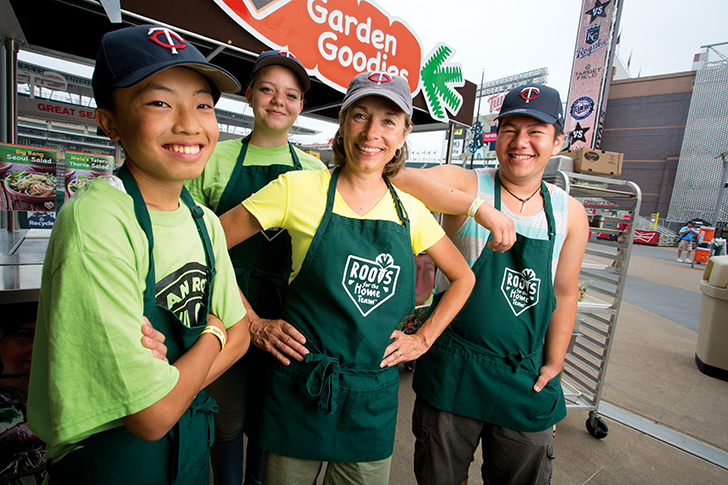 Beyond Target Field, Roots promotes and sells the salads in two Twin Cities co-op grocery stores and at several Kowalski’s Markets. The Roots team even marketed the garden partners’ beets for beet-flavored ice cream at locally owned Izzy’s Ice Cream Shops in 2014. Moores expects new products this year, plus Garden Goodies carts and sales teams at more athletics venues in the Twin Cities. Mary Gunderson (L)(’77 home economics journalism) of Edina, Minn., is an author, lecturer, and the owner of History Cooks. Urban Roots youth rallied around this Korean salad concept. It features several of the vegetables found in their seven gardens on the east side of St. Paul. 1. Break noodles into shorter lengths; cook according to package directions. Rinse with cool water; drain well. 2. Meanwhile, mix remaining salad ingredients in a large bowl. Stir in cooked noodles. together in a small bowl. I love this! Where can I find out which Twins games they’ll be at? Thank you! I’ll be there May 30 and will try it out.